In this Feb. 22, 2018, file photo, the U.S. Federal Reserve building stands in Washington, D.C. Here's a breakdown of what could happen to your student loan tab, savings account, mortgage, car loan and credit card. With the Federal Reserve's latest quarter-point interest rate increase (and still more likely to come), the pressure is mounting for consumers. 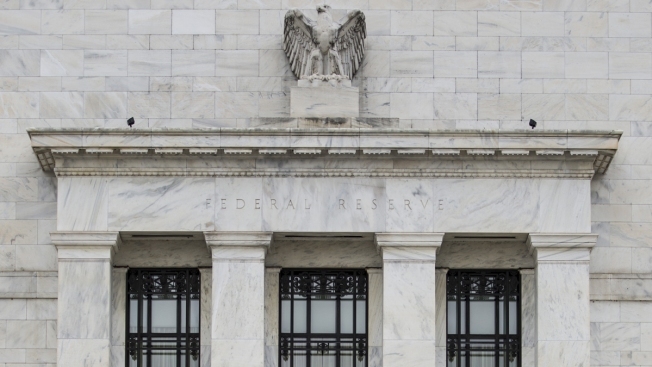 The Fed's eighth hike in two years pushes the federal funds rate target to a new range of 2 to 2.25 percent. That rate is closely tied to consumer debt, particularly credit cards, home equity lines of credit and other adjustable-rate loans. "The cumulative effect is growing and it's going to place greater strain on households with variable-rate debt and tight budgets," said Greg McBride, chief financial analyst at Bankrate.com. For the average American, recent signs of rising inflation, which pushed the central bank into hiking rates beginning in 2015, aren't necessarily bad. They're generally considered an indication that the economy is doing well, and pave the way for pay raises and a better return on your savings. Final Trades: INTC, EWW & more from CNBC. On the upside, stashing some cash in a savings account is finally paying off. With a savings rate, or annual percentage yield, of 0.2 percent, a $10,000 deposit earns just $20 after one year. At 2.25 percent, that same deposit would earn $225. "Shoot for 2 percent but you can do even better," McBride said. "Earning any less than that means you're not keeping pace with inflation and you are losing money." However, in daily life, higher interest rates mean that you'll have to pay up to access credit. If you're concerned about what an additional increase in the Fed's benchmark rate will mean for your own bank account, mortgage or credit card, as well as student debt, home equity loan and car payment, here's a breakdown of what's ahead — and what you should do about it now. For starters, credit card rates are already at a record high of 17.32 percent on average, according to Bankrate. Most credit cards have a variable rate, which means there's a direct connection to the Fed's benchmark rate, and as interest rates rise, cardholders will continue to get squeezed. The typical American has a credit card balance of $6,375, according to Experian's annual study on the state of credit and debt in America. Total credit card debt has reached its highest point ever, surpassing $1 trillion in 2017, according to a separate report by the Federal Reserve. Tacking on a 25-basis-point increase will cost credit card users roughly $1.6 billion in extra finance charges in 2018, according to a WalletHub analysis. Factoring in the previous rate hikes, credit card users will pay about $11.26 billion more in 2018 than they would have otherwise, WalletHub said. What you can do about it: Shop around for a better rate or snag a zero-interest balance transfer offer to insulate yourself from further rate hikes. Just be sure to check the fees and terms, cautioned Matt Schulz, chief industry analyst at CompareCards. Those offers aren't as generous as they used to be. Then, begin to aggressively pay down your balance. "The best thing that cardholders can do is make the rate hike a moot point by paying the balance in full every month so all of these rate hikes are a nonissue," Schulz said. The economy, the Fed and inflation all have some influence over long-term fixed mortgage rates, which generally are pegged to yields on U.S. Treasury notes, so there's already been a spike since since the Fed started raising rates. The average 30-year fixed-rate is now about 4.7 percent, up from 4.09 percent in 2015. That has cost the average homebuyer roughly $42,000, WalletHub found. Many homeowners with adjustable-rate mortgages or home equity lines of credit, which are pegged to the prime rate, will also be affected. While some ARMs reset annually, a HELOC could adjust within 60 days. What you can do about it: Those with an ARM can still refinance into a fixed rate that's lower than what your ARM will adjust to later this year, said Tendayi Kapfidze, chief economist at LendingTree. "My expectation is that we are in an upward trend so sooner is better than later." "If the fed funds rate continues to go up, there's no guarantee these rates will be available to you down the line," he added. If you have a HELOC, ask your lender to freeze the interest rate on your outstanding balance or consider refinancing into a fixed-rate home equity loan, although that puts a cap on how much money you can access. For those planning on purchasing a new car in the next few months, Wednesday's change likely will not have any big material effect on what you pay. A quarter-point difference on a $25,000 loan is $3 a month, according to McBride. Currently, the average five-year new car loan rate is 4.8 percent, up from 4.34 percent when the Fed started boosting rates, while the average four-year used car loan rate is 5.49 percent, up from 5.26 over the same time period, according to Bankrate. However, tack on rising auto prices and longer loans to climbing interest rates and car buyers may end up with sticker shock. A buyer who finances their purchase could pay about $6,500 more than they would have five years ago, according to research from Edmunds.com. What you can do about it: If you are car shopping, start by checking that your credit is in good shape, negotiating the price of your vehicle and shopping around to secure the best rate on your financing. Very low rates are often still available, especially through manufacturers who subsidize financing deals on new car models. Alternatively, consider a pre-owned car, which is less expensive to buy at the outset and lowers depreciation costs substantially over time. While most student borrowers rely on federal student loans, which are fixed, more than 1.4 million students a year use private student loans to bridge the gap between the cost of college and their financial aid and savings. Private loans may be fixed or have a variable rate tied to the Libor, prime or T-bill rates, which means that as the Fed raises rates, borrowers will likely pay more in interest, although how much more will vary by the benchmark. What you can do about it: If you have a mix of federal and private loans, consider prioritizing paying off your private loans first or refinance your private loans to lock in a lower rate, if possible. "But in general, a rising rate environment could mean less attractive refinancing options," said Nick Clements, co-founder of MagnifyMoney.com.